William Wilson was born in Fife Shire, Scotland in 1816,he worked as a gardener, then served in the British army in Corfu, before immigrating to Australia and settling in Penola in 1861. 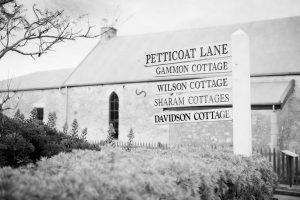 Wilson, using his experience from Scotland and the Greek Isles established a remarkable garden on his Petticoat Lane property. John Riddoch was very impressed with the garden growing in the terra rossa soils and went on to establish the Penola Fruit Colony, which has become the Coonawarra wine region. This Shiraz Cabernet is made in the old ‘Coonawarra’ style and celebrates the legacy of William Wilson. Released in the 200th year since his birth, it is a collaboration between his descendants, the Redman and Balnaves families, who proudly continue to produce wine in Coonawarra. Made from 55% Redman’s 80 year old North End Shiraz and 45% Balnaves 43 year old Paulownia Cabernet Sauvignon vines, the fruit was hand-picked, destemmed and fermented in open topped fermenters with plunging and pumpovers. The Cabernet spent 26 days on skins. Maturation for 18 months in French oak barrels (38% new) preceded blending and bottling in February 2018. Deep red in colour, the nose displays dark mulberry and blackberry fruit with highlights of violets and subtle spicy French oak. The palate is smooth and light with fine grained tannin and great balance of fruit and structure. A wine to cellar that celebrates the 121 year winemaking history of Coonawarra and the man who inspired its beginning, William Wilson. Drink now or with careful cellaring this wine will reward for many decades. 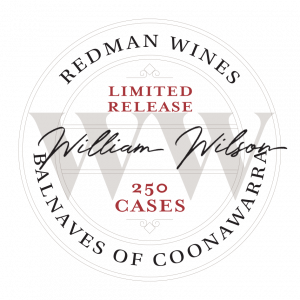 William Wilson’s direct descendents, the Redman and Balnaves families, are proud to produce this wine to celebrate the 121 year winemaking history of Coonawarra, and the man who inspired its beginning, William Wilson. 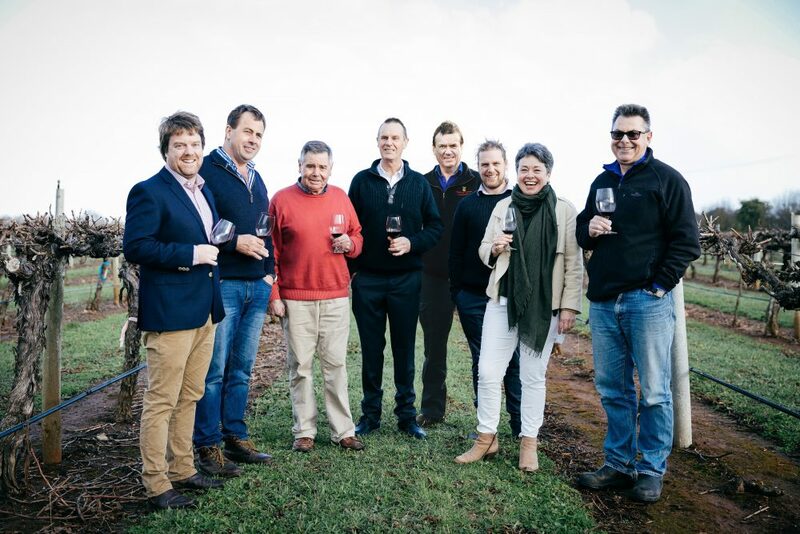 L to R - Dan Redman, Pete Balnaves, Doug Balnaves, Mal Redman, Bruce Redman (Redman Winemaker), Mike Redman, Kirsty Balnaves, Pete Bissell (Balnaves Winemaker). Just 250 dozen of the limited release 2016 William Wilson Coonawarra Shiraz Cabernet have been made. This wine is only available direct mail order or by visiting Redman’s and Balnaves’ cellar doors. Discount not applicable to Balnaves Wine Club members. On 10 September 1816, a young Scot named William Wilson entered the world, in the small town of Cupar, in Scotland’s Fife Shire. William’s love of nature started young and his affinity with the earth saw him appointed as a gardener to a nearby estate in Fife. He later enlisted in the 42nd Regiment of the Black Watch Highlanders , spending six years serving in Ireland and the Mediterranean, where he was stationed at various times on the Greek Islands of Zephalonia, Zante and Corfu. It was here he would learn about viticulture and horticulture. Like many Scots, William and his family dreamt of adventure and opportunity in a faraway land and they left everything to emigrate to South Australia in 1849. William was 33 when he landed at Port Adelaide (known then as ‘Port Misery’) and from there the family boarded the 18-tonne Cutter Resource to Robe. They then travelled to Killanoola, 26 kilometres north of Coonawarra, the journey taking two weeks longer than expected because the kegs of beer on the bullock wagon were frequently quaffed by the thirsty bullockies, rendering them too drunk to travel. After arriving in Penola, William sought his luck on the Victorian goldfields returning with £300, purchasing Lot 133 in Petticoat Lane, Penola and building a four-bedroom home for his wife Agnes, using Mount Gambier stone. William soon established a productive orchard and market garden, generously sharing his horticultural knowledge with other settlers, among then fellow Scot and pastoralist John Riddoch. Riddoch owned a vast sheep and cattle station called Yallum Park but had a philanthropic dream to establish a fruit-growing colony populated by small independent farmers or “blockers”. He sought advice from William Wilson about the best location of the settlement and the experienced horticulturist recommended that rather than the black soils of Yallum Park, he settle north of Penola due to its free draining, fertile terra rossa. 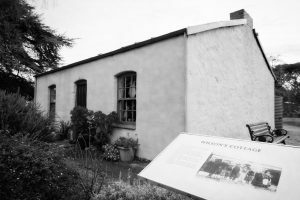 In 1890 Riddoch took Wilson’s advice, founding the 1150 acre Penola Fruit Colony (later the Coonawarra Fruit Colony) and overseeing the planting of Cabernet and Shiraz vines and fruit orchards and building a large and imposing winery (now Wynns Coonawarra). William Wilson died in 1891 before the Great Bank Crash of 1893 that ended Riddoch’s dream. 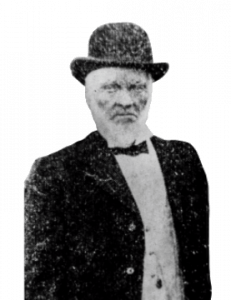 However, while most of the small fruit growers returned to dairy farming or laboring some saw the future in wine – among them William’s grandson Bill Redman. Bill purchased 40 acres of vineyard in 1908 and made his first wine in 1909. For the next 30 years Bill sold his bulk wine to other Australian wineries including Yalumba, Woodleys and Tolleys. He was joined by his son Owen in 1937 and after years of hard work and patient investment, Redman Wines was able to capitalize on the Coonawarra boom of the 1970s. Meanwhile, Bill’s sister in law Jessie had married local farmer William Balnaves, starting a lineage that would lead to the establishment of Balnaves of Coonawarra in 1974. Doug and Annette made their first wine in a concrete vat with the help of Bill Redman and went on to become one of the region’s most respected brands. Today, William Wilson’s great-great-great-grandchildren Kirsty Balnaves, Pete Balnaves, Dan Redman and Michael Redman continue to produce some of the most famous wines from the Coonawarra terra rossa strip that their descendant discovered.